What is short term physical rehab? A short term rehab program provides various types of therapy for people who are recovering from surgery, illness or an accident. A patient receiving short term rehabilitation may be in the program for anywhere from a couple of days to several weeks. Short term rehab programs enable patients to reach their maximum functionality and get back to their homes and their lives in the least possible amount of time. Patients may receive physical, occupational, and/or speech therapy from skilled therapists. These therapists are members of a team that also consists of physicians, nurses, social workers, and nutritionists. The team works with the patient and his/her family to create an individualized care plan. There are many benefits to receiving short term physical rehab at Dyer Nursing and Rehabilitation Center. Our highly skilled and compassionate therapists work with you to develop an individualized care plan. They manage that plan and send regular updates to your physician to keep him/her informed of your progress. 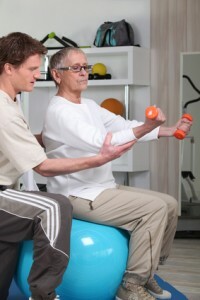 Your therapists will integrate rehab activities into your daily life whenever possible. Improving your functioning and strength will translate into restoring skills in areas of daily living. Short term rehab provides you with the rest, the nutrition and the specialized equipment necessary for your complete recovery. Short term rehab services at our facility provide you with all your therapy services in one place. No need to schedule appointments and arrange transportation to and from therapy. The rehabilitation team will also assist with arranging home care services when it is time for you to transition to home. Many private insurance plans and HMOs provide short term rehabilitation benefits. Check your specific policy for information on your coverage.